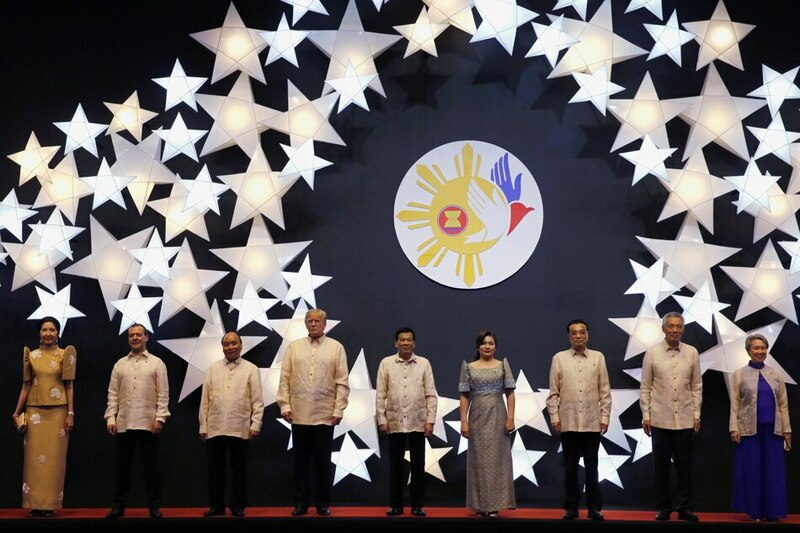 MANILA - Leaders from across Asia joined US President Donald Trump at an extravagant gala dinner in the Philippines' capital on Sunday, a show of amity in a region fraught with tensions that have lurked behind his marathon tour of the continent. President Rodrigo Duterte set the tone of cordiality ahead of the 2 days of summit meetings he will host, suggesting that despite their differences over claims to the South China Sea, the leaders should not discuss the issue. "We have to be friends, the other hotheads would like us to confront China and the rest of the world on so many issues," Duterte said at a business conference, as planes carrying heads of state and government attending the summit landed in quick succession in Manila. Hours earlier, during a bilateral visit to Vietnam, Trump offered to mediate in the dispute over the South China Sea, where 4 Southeast Asian countries and Taiwan contest China's sweeping claims to the busy waterway. All the claimants will be at the summit, except for Taiwan. Trump will join leaders of Southeast and East Asian nations in Manila over the next two days, the last leg of a tour that has taken him to Japan, South Korea and China as well as Vietnam. The sheer length of the trip - the longest to Asia by a US president in more than a quarter century - may reassure some that, despite Trump's "America First" policy, Washington remains committed to a region China sees as its strategic domain. Each of the men sported a cream-colored barong, a traditional Philippines shirt made of fiber from the pineapple plant, embroidered and worn untucked. They were served a 4-course Filipino-Asian fusion meal curate and prepared by Chef Jessie Sincioco, who also designed the menu for Pope Francis when he visited the Philippines in 2015. Police used water canon to prevent hundreds of protesters reaching the US embassy in Manila ahead of Trump's arrival. Carrying placards declaring "Dump Trump" and "Down with US Imperialism", the left-wing protesters were blocked by police in riot gear with shields and batons, and then showered with jets of water from a fire engine. The United States and its former colony, the Philippines, have been strategic allies since World War Two. Trump is expected to try during the summit to shore up relations, which have been strained by the mercurial Duterte's notorious anti-US sentiment and his enthusiasm for better ties with Russia and China. Duterte said last week he would tell the US president to "lay off" if he raised the issue of human rights when they met. More than 3,900 Filipinos have been killed in what the police call self-defense in a war on drugs declared by Duterte. Critics say executions are taking place with no accountability, allegations the police reject. But Trump, who has been criticized at home for neglecting rights issues in dealings abroad, praised Duterte in May for doing an "unbelievable job on the drug problem". During his tour, Trump and his team have repeatedly used the term "Indo-Pacific" instead of "Asia-Pacific" for the region, which some see as an effort to depict it as more than China-dominated. Pacific Rim nation leaders agreed in Vietnam on Saturday to address "unfair trade practices" and "market distorting subsidies", a statement that bore the imprint of Trump's efforts to reshape the global trade landscape. The summit of Asia-Pacific Economic Cooperation (APEC) countries in Vietnam put on show the contrasting vision of the "America First" policy with the traditional consensus favoring multinational deals that China now seeks to champion. Manila hosted the APEC summit 2 years ago, and at that meeting Canadian Prime Minister Justin Trudeau won a Twitter poll with the hashtag #APEChottie that asked people to vote for the most attractive leader there. Journalists swarmed the youthful leader and screamed in excitement. On his latest visit, Trudeau visited an outlet of Jollibee, a chain that has become a byword for Filipino fast food, chatting and posing for selfies, charming the people of Manila again.